Braves fans apparently missed the memo that last night’s Atlanta-Nationals matchup was ESPN’s game of the week. Turner Field was a little more than half full, with just over 29,000 in attendance. That’s even counting the canines that came with their owners for “Bark in the Park” night, and before the persistent mid-game drizzles sent fans in search of shelter. It’s surprising that the game was so sparsely attended, as it was potentially Chipper Jones’s seventh-to-last game in Atlanta (wild-card and playoff games pending). Five and a half months into his season-long farewell tour, Chipper’s imminent departure hasn’t truly hit most Braves fans yet. This certainly was, however you look at it, the final home game before Chippermania comes to full fruition in the season’s final weeks. In the bottom of the third inning, “Crazy Train” blared across the stadium PA as no. 10 strolled to the plate for his second at-bat, following a Jason Heyward single that advanced Michael Bourn to third. Jones didn’t swing at his first four pitches, astutely observing Gio Gonzalez’s initial approach. He fouled off a 2-2 pitch and held back on an inside toss, which made the count full. The count remained the same after he smacked one more ball right down the first-base line and just out of play. On his eighth pitch, Jones connected for a perfectly placed RBI single that dribbled through left center, just out of shortstop Ian Desmond’s reach. Braves 1, Nationals 0. It was a flawless at-bat, seasoned with the elegant patience of a 19-year veteran. Jones didn’t only serve his stat line, but made an impact beyond his individual plate appearance. He advanced Heyward to third, giving a typically free-swinging Freddie Freeman a chance to hit a sacrifice fly. While the box score only gave Jones credit for one of those runs, he facilitated both. Jones’s ability to change the game, even when he’s not involved in the action, is what makes him so indispensable. I spoke with legendary Braves pitcher Tom Glavine this weekend about Jones — starting with his first recollections of the Floridian third-base prospect, who was chosen over Todd Van Poppel as the no. 1 pick in the 1990 MLB draft. 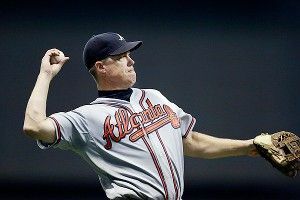 As we got into Glavine’s left-handed battles against the great switch hitter from his five-year stint with the Mets, he put the Chipper effect into full perspective. Jones walked in his next two appearances against the Nationals, scoring as part of a three-run seventh inning sparked by Dan Uggla’s momentary redemption from a 154-strikeout season that has been, in many ways, the antithesis of a typical Chipper Jones campaign. In some fashion, Jones was involved with four of the Braves’ five runs — a respectable amount for a Braves team that has struggled offensively for the past month. Sunday night’s performance continued a long line of games anchored by the franchise cornerstone/third baseman. He influenced both his opposing team’s preparation as well as the outcomes of games with his own bat. No matter how you look at his career statistics, that kind of impact will be hard to account for following his retirement. In talking to Brian McCann this weekend, I made the mistake of asking the Braves catcher — a Georgia native, onetime childhood Chipper adorer, and eventually an all-star-caliber player — what Jones leaves to be replaced once he retires. Max Blau is a staff writer at Creative Loafing and contributes to the Atlanta Journal-Constitution, NPR and Paste Magazine. What's So Great About Lane Kiffin?